Microsoft has launch new Office 365 plan since October 2014. 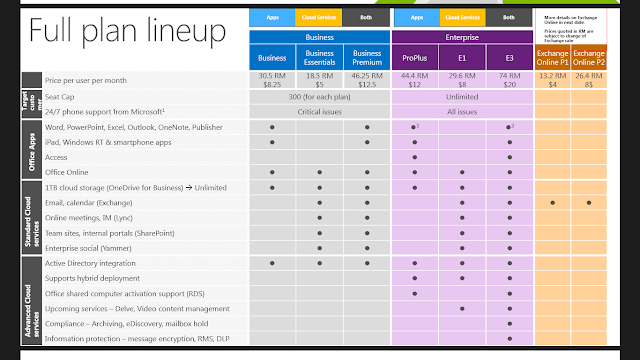 Old plan comprises Office 365 Small Business, Office 365 Midsize Business and Office 365 Enterprise E3. Customer complaint it is expensive and some might only need Office like Word, Excel, Powerpoint but do not required email or exchange online as it is cheaper they get their company email via a hosting company which host their website and email. Some who want to replaced their old Exchange server but might not required to change their Microsoft Office. Thus, Microsoft have separate Office and email under two different plan. Now, customer can choose either Microsoft Office like Word, Excel, PowerPoint etc or email and Calendering or both. 1) If you want Office only, there is Office 365 Business or Office 365 ProPlus. Next : we will analyse what is the upgrade path for each plan.